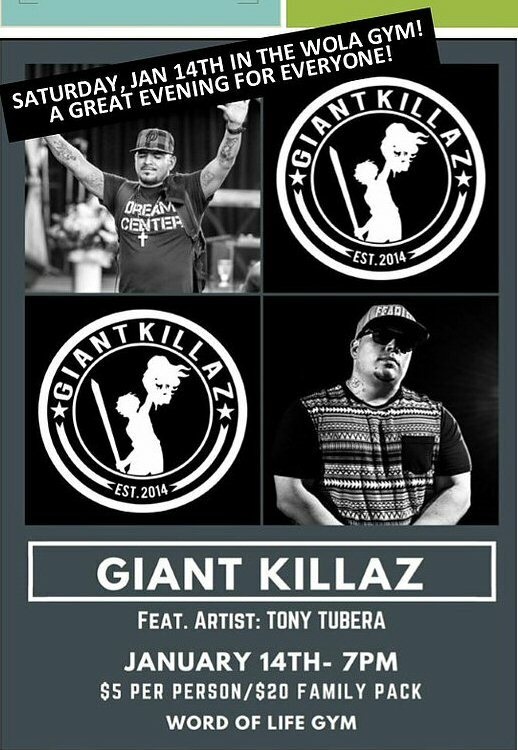 Saturday evening January 14 at 7 p.m., the Giant Killaz Tour, will be coming to the Word of Life gym. The event is being cosponsored by WOLA and Four Square Solid Rock churches. Admission is $5 per person or $20 per family. The concert will feature Christian rap music and testimony. The featured artists will be Tony Tubera and Danny Trejo. The Giant Killaz tour is organized by Kingdom Muzic. There should be a good turnout for the event because people are planning to come from locations in Northern California and Southern Oregon. Here is one the promos for the Giant Killaz Tour from last year.